NOTES: Soooo nice to have this subject kitted in a decent scale! If you were to ask the average individual when the first successful attack by a submersible warship was, what do think their answer would be? Most are shocked to learn that it was February 17, 1864 with the sinking of the USS Housatonic by the CSS Hunley. H. L. Hunley, often referred to as Hunley. It was a submarine of the Confederate States of America that played a small part in the American Civil War, she was named for her inventor, Horace Lawson Hunley, shortly after she was taken into government service under the control of the Confederate States Army at Charleston, South Carolina. Hunley demonstrated the advantages and the dangers of undersea warfare. She was the first combat submarine to sink a warship (the aforementioned USS Housatonic) and although the Hunley was not completely submerged, following her successful attack, was lost along with her crew before she could return to base. The Confederacy lost 21 crewmen in three sinkings courtesy of the Hunley during her short career. She was nearly 40 feet (12m) long, was built at Mobile, Alabama, and launched in July 1863. She was then shipped by rail on August 12, 1863 to Charleston. Hunley (then referred to as the "fish boat"; "fish torpedo boat"; or the "porpoise") sank on August 29, 1863, during a test run, killing five members of her crew. She sank again on October 15, 1863, killing all eight of her second crew, including Horace Hunley himself who was aboard at the time, despite not being a member of the Confederate military. Both times Hunley was raised and returned to service until her demise. What glorious times we live! A quick internet search and order online and in no time a box from the Ukraine arrives in the post! Holy stamps Batman! Upon opening the stamp festooned box and after digging out all the foam packing I found:1 Hryvnia note (essentially a Ukrainian dollar),2 “Fizzy” candies,1 packet of honey, 2 note cards; one is a “Thank You” note and the other is contact info,and finally, 2 hull halves, 2 sprue of gray plastic, 1 sprue of clear, a sheet of photo-etch and a sheet of masking. For a fairly small subject there are quite a few pieces! By my count there is 28 gray, 26 photoetch, 18 clear parts for which a small sheet of masking is provided. (Small sheet of paper in the photoetch sleeve.) Kit is typical of most eastern European kits showing an almost short run quality. (IE no locating aids for the hull halves and a bit of flash.) However for the AMS folks the external detail carries through to the interior so the basis is there to scratch build the interior or maybe build her up partially disassembled undergoing conservation. 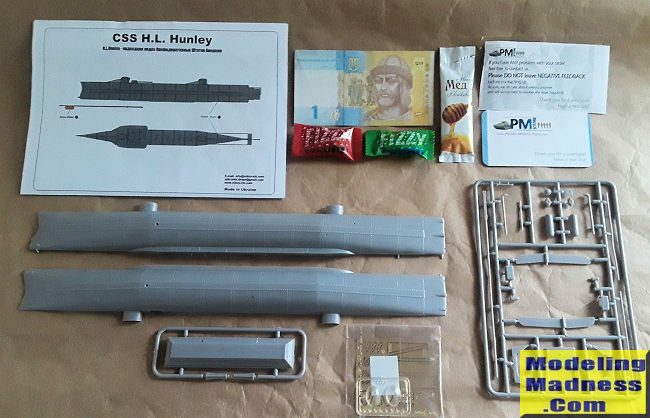 With a strong magnifier and patience this will build into a solid replica of H. L. Hunley. Armed with adequate references, an exact point in time can be modeled as the Hunley changed significantly during her short career. Also, portraying the distressed weathered appearance will add a challenging aspect to the simple black color scheme. Thanks to for the review kit. You can find this kit at your favorite hobby shop or on-line retailer.